Maurice Brooks, who is an NBA contributor to ESPN.com has been running his "Race to the MVP" all season long yet it doesn't seem like anyone talks about it much. In fact, I'm not sure even how to find the page except for a random link at the bottom of the NBA-ESPN.com page that I stumble to every so often. I just found it interesting to see Brooks place Brandon Roy in the 6th overall spot in the entire league as an MVP candidate. This is the exact spot that I'd put him in as well - you could argue against the other players listed ahead, but they are all worthy. And it also brought a smile to my face to see Brandon finally grabbing the attention of national sports writers. I know we've all seen his growth and dominance, but to see the recognition come from outside of the west coast really means something. So when you look at the stats, it really becomes hard to argue that he is not the 6th or 7th best player in the entire NBA. 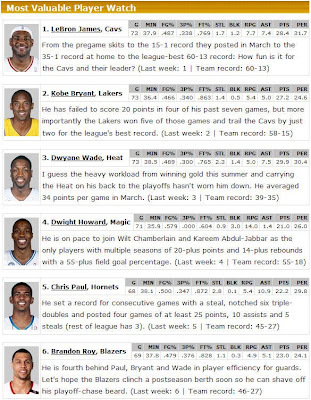 Seriously, his PER is 7th best in the league and only 0.18 lower than Kobe's...need I say more? Now sit back and think about that. The 6th best player in the NBA, plays for "your" Portland Trail Blazers.